A fixed amount is awarded instead of reimbursing actual meals and incidental expenses with no receipts required. Anyone who travels out of town overnight for work is allowed to claim per diem. A driver must be working away from home for at least 12 hours. This refers to the day a driver starts and ends their travel. 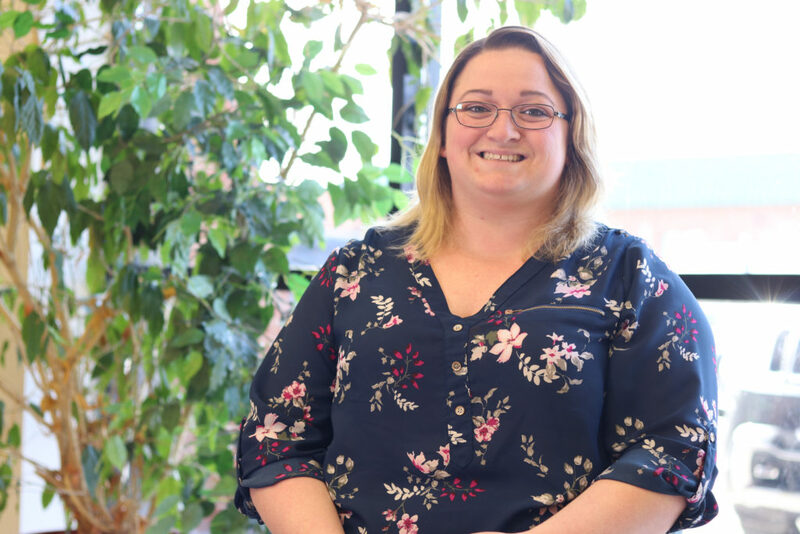 Within a reasonable amount of time the driver must substantiate “Time, Date, and Place,” business connection and purpose of travel. A drivers HOS log provides the required substantiation. company drivers are no longer allowed to deduct Per Diem as an itemized deduction when filing their year end taxes. Only drivers who participate in a company sponsored program, like Omnitracs Per Diem Manager, can take advantage of the substantial tax benefits that come with Per Diem. A driver who is out of town overnight may receive one $66 meals & incidental expense reimbursement up to 7 times per week. A driver must depart for an overnight trip before 12:00 noon to be awarded Per Diem on the first day away from home, and return home after noon to be awarded Per Diem on the last day away from home. 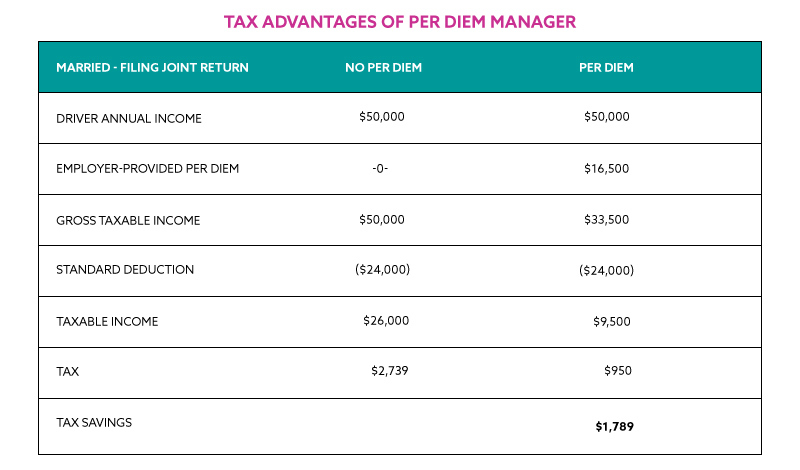 Per Diem is awarded when traveling a least 25 miles away from your tax home zip code. IRS-required “Time, Date and Place” substantiation is retained and accessible to a driver for 7 years. 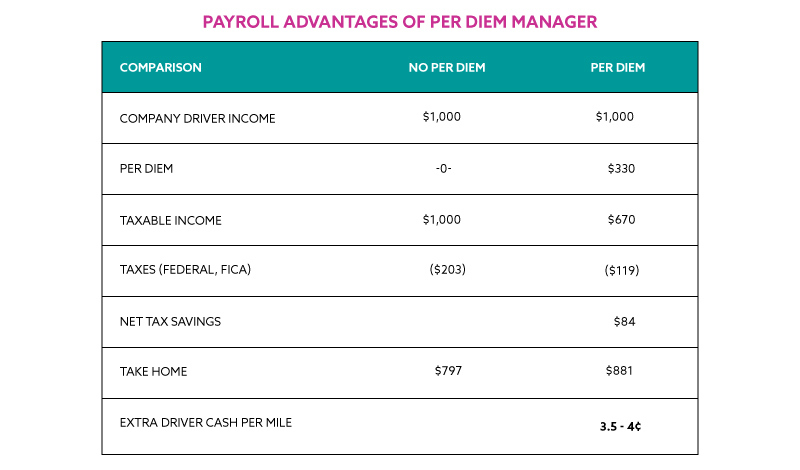 Per Diem Manager is provided as a benefit to company drivers at no cost to the driver. Owner Operators per diem is not calculated in payroll. It is compiled for an end of year reporting.